In Cameroon with the exception of all the region of the East (where one does not encounter Cercestis camerunensis ) and some of the dry northen regions, this is encountered in all the understorey of dense humid forest, often on fresh soil, indeed even humid or swampy but not necessarily; In gallery forest and savanna. This species is found equally in Nigeria and Gabon. Plant semi-erect, on stilt roots, reaching up to 50 cm in height, with a very short thick stem, then creeping by a stolon emerging from the apex, and bearing the leafy shoots, then climbing and reaching up to 30 m above the ground. There are two types of aerial roots; long vertical roots, reaching the ground, very flat, 1.5-2 (-4) cm wide, puberlulent, not verrucose; horizontal anchor roots, shorter, 10-20 cm long, these are also flattened and puberulent. Two types of stem: a very vigorous stem, formed by the joining of the base of the petioles, 3-6 cm diam. 50 cm long maximum; A more slender stolon allowing the progression of the plant, either on the ground or on a supporting tree. LEAVES with petiole 60-100 cm, deeply canaliculate, broadly sheathed to nearly half their length, sheath terminating in two rounded auricles; blade 35-150 cm, ovate, base broadly truncate in young leaves, becoming cordate, apex obuse-acuminate; blade perforated, later split, at maturity becoming completely divided; venation palmate with 5-6 basal veins on both sides of the midrib; 2-4 pairs of primary lateral veins, very prominent, alternate, ascending, each branching into numerous equally ascending secondary veins; network of secondary and tertiary veins more attenuate and elongated. INFLORESCENCES terminal, generally numerous, not appearing on climbing plants, at more than 3 m above the ground, occasionally less; bracts common, pale green or purplish surrounding together the inflorescences and releasing on opening a bunch of 6-16 spadices, each subtended by a pale green bract; Spadix with a long peduncle up to 18 (-25) cm, topped by a yellowish green, fleshy spathe, 10-18 cm long, obtuse at apex, inflorescence exuding a reddish liquid from the opening; Female flowers with subobpyramidal pink ovary, surmounted by a small white, sessile, discoid stigma; a single locule with a recurved ovule; streaks of jelly emitted from the placenta. INFRUCTESCENCE: Fruiting spadix 9-14 x 6 cm, surmounted by a persistent appendix, the remains of the male part, ca. 9 cm long. 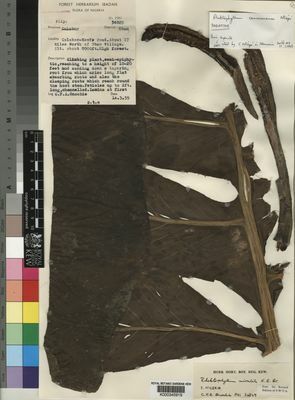 The flattened aerial roots are extracted of their fibres, used for rope making and perhaps for weaving.